During May's Season 1 finale of DC's Legends of Tomorrow, Suits star Patrick J. Adams was introduced as comic book character Hourman, teasing that the Justice Society of America is coming to the show. It was revealed at Comic-Con last month that Justice Society characters Obsidian, Stargirl and Dr. Mid-Nite will also debut during Season 2. But they hadn't been cast at that time. Today, we have word that Sarah Grey (Power Rangers) has come aboard to play the new Stargirl. IGN has the casting news, but they don't indicate how large a role she may have on Season 2 of Legends of Tomorrow, or when she may make her debut. We also don't know when the other characters teased in the Comic-Con trailer may be cast, but we reported last month that Maisie Richardson-Sellers has come aboard as the new Vixen, while Matthew MacCaull is playing Commander Steel. The Stargirl character was previously portrayed by Britt Irwin on Smallville. It was also revealed at Comic-Con that the Legends of Tomorrow will be facing off with the The Legion of Doom. Malcolm Merlyn (John Barrowman) and Damien Darhk (Neal McDonough) from Arrow will be teaming up with The Flash's the Reverse-Flash (Matt Letscher) and former Legends of Tomorrow member Captain Cold (Wentworth Miller) as this villainous group. Wentworth Miller and John Barrowman have both struck similar deals with The CW that makes them series regulars on all of the network's shows, including Arrow and The Flash, while Neal McDonough will recur on Legends of Tomorrow and Matt Letscher will be a series regular on Legends of Tomorrow. 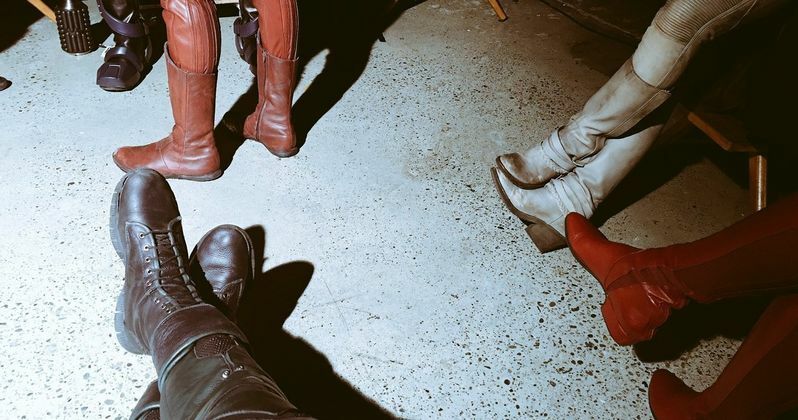 In related news, Arrow star Stephen Amell posted a new photo on Twitter that featured a number of The CW's heroes on set together. The photo includes Green Arrow (Stephen Amell), The Flash (Grant Gustin), Supergirl (Melissa Benoist), White Canary (Caity Lotz) and The Atom (Brandon Routh). We're not sure why all of these characters from different shows were together, but it could be for a new promo featuring The CW's heroes. We know all of these characters will meet in an epic crossover, but during a new interview with Entertainment Weekly, executive producer Greg Berlanti reveals they are just starting to break that story, which will be spread out over all four of the network's superhero shows during one epic week. Here's what he had to say about the propsed threat all of these heroes will face. "I'm going to probably try to have one unifying threat, as opposed to different things on different ones, which is what the first year was." Last year's CW crossover helped set up Legends of Tomorrow, by introducing Hawkman (Falk Hentschel), Hawkgirl (Ciara Renee) and the villainous Vandal Savage (Casper Crump). The CW's superhero lineup kicks off this year with The Flash, which debuts with the Season 3 premiere on Tuesday, October 4, followed by the Season 5 premiere of Arrow on Wednesday, October 5. Supergirl makes its CW debut with the Season 2 premiere on Monday, October 10, and Legends of Tomorrow returning on Thursday, October 13. Take a look at the photo below, and stay tuned for more on all of The CW's superhero shows.